BER is presently beta-testing our online Client Management Database for use by our Rater members, with an anticipated launch to all of our members by late June. The software – which we commonly will refer to as the BER Rater Portal - has several features which are designed to improve our Raters’ communication with BER, to provide easy access to a wealth of technical resources, and to facilitate the process for ordering administrative services from BER. 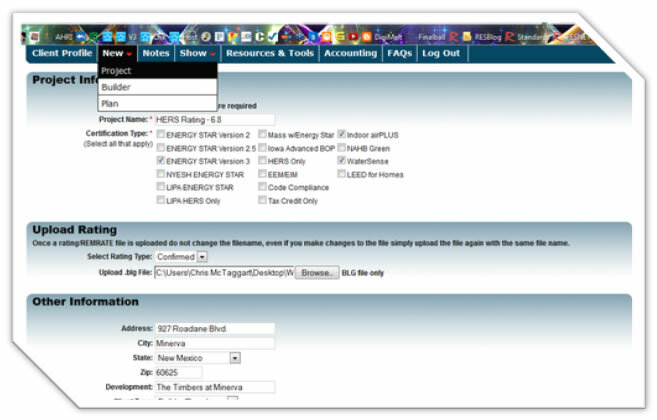 Once fully tested and approved, access to the BER Rater Portal will be gained through the “Login” tab on the BER website. Upon entering the portal, Raters will have access to a unique page dedicated specifically to their business. The Rater Portal will first and foremost serve as a method to submit and track services requested from BER, such as rating QA submissions. Raters will also be able to request a variety of new administrative services, such as ratings from plans, client/builder packet assembly, Manual J load calculations, and rebates processing- all of which can be read about here. The portal will track services ordered, the status of each, and will serve as a more efficient way of communicating and tracking than email submission. The Rater Portal will also serve as an efficient project management tool for our Raters. In addition to managing rating submissions made to BER, the portal helps store and organize information about projects and ratings, details about rating clients, as well as professional documentation for our Raters’ companies. With the ability to view, arrange, and edit/update information in one centralized location, and automatic notes function to archive the history of changes made and other forms of activity done within the portal, storing information on spreadsheets will become a thing of the past. Furthermore, the Portal’s web-based interface will allow Raters to access this vital information from anywhere they have internet access. The Portal will also be a key source of industry news and information for its users, with articles, tools, videos and links that will be available to BER members only. This information will be used by our members to better understand and achieve industry standards, implement new strategies to better serve their clients, and to facilitate their businesses. 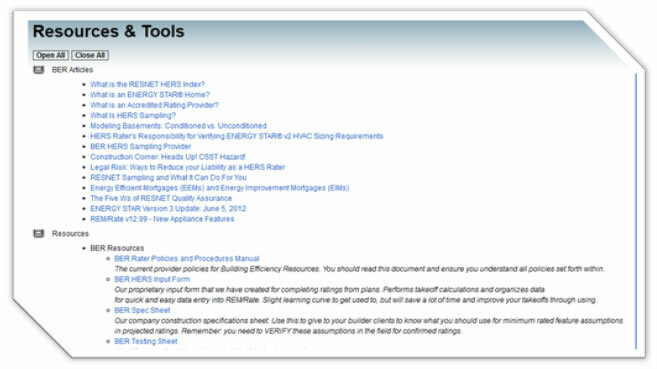 A set of BER-designed proprietary tools is there to help Raters be as efficient and as successful as possible. We anticipate that this aspect of the Portal will become a growing wealth of key information. This first release of the portal will serve as the first of many in coming months. We will seek and respond to feedback from the users of the software so as to make the software serve its user’s better. It’s an exciting time to be a part of the BER team and we look forward to growing and working together for a brighter future for all.